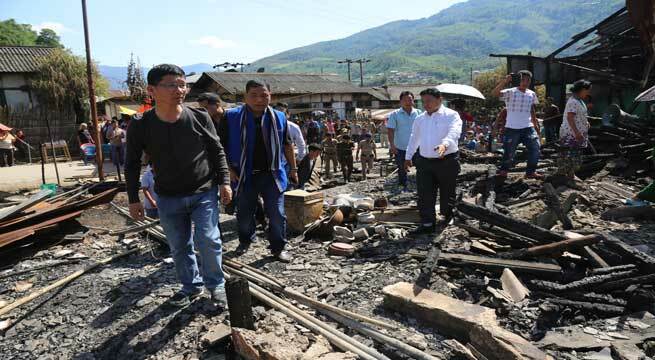 Chief Minister Kalikho Pul today visited the fire accident site at ALC colony in Seppa, where 27 houses were consumed by the Friday’s raging inferno. Accordingly, the CM handed over ex-gratia relief of Rs 101900 to each 17 fire victims whose house suffered full damage, with an additional Rs 1 lakh distributed from the Chief Minister’s Relief Fund.In addition to compensation to the owner of the house, the CM also distributed relief for the tenants acknowledging the losses they too suffer during the disaster. He handed over Rs 1 lakh from CMRF fund for each of the 11 victims identified as the tenant. Also acknowledging the service of ALC community to the state government and to the people, the Chief Minister donated Rs 2 lakhs from his salary for the 6 ALC workers identified as the fire victim. This in addition to the immediate fire relief of Rs 3800 distributed to them. Mr Chief Minister recalled his last visit to Seppa when he was the Finance Minister, and had found numerous electricity theft cases in the town. Also the people didn’t follow necessary precautions or seek help of experts in electrification works. The CM therefore urged the citizen to cooperate the government in its effort to reduce the fire incident caused from carelessness. Mr Chief Minister informed that his government is doing all possible deeds for betterment of the people, particularly the poor. He informed that whatever the financial assistance was provided is over and above the government prescribed norms. He himself is from poor family and once worked as labourer, he knows the necessity and hardships faced by contingency labour. He assured them to build dwelling units for them besides the financial assistance as such distributed. He directed the DC East Kameng to prepare a plan with estimates and forward it to him for immediate approval. He also suggested for construction of two-three storey-building units so that many can be accommodated in small area. Saddened by recurring fire accident, he has suggested that there should be a provision of keeping fire extinguisher, particularly in every shop since market is the place where people movement is the largest and continuous. He directed the DC to ensure compliance of the provision by shopkeepers. He has directed the SP to ensure that fire tender vehicle should be in ready position 24X7. He directed the DC and the SP to identify locations for construction of water tank so that fire tender vehicle could be refilled immediately during occurrence of any eventuality. He informed that his government has raised the emoluments of contingency workers, ANMs and others. The CM said he did not come here only to compensate the loss, but to advice people on fire safety precautions. He said the new government is always ready to help people in need but in turn they also must cooperate. He also said the new government has enhanced the fire relief from earlier existing Rs 5000 to Rs 101900. The CM further directed the district administration to conduct inquiry on the cause of fire accident since knowing the cause of the accident may prevent future occurrence. He also instructed the bazaar committee to install fire extinguisher in all shops. The CM assured to work on the provision for overhead water tank in the bazaar with water hydrant for immediate supply of water to fire tanker during the fire emergencies. The Chief Minister also promised to immediately construct the ALC barrack, which was made on appeal from several local organisations who feared of land encroachment on the site. He appreciated the wholehearted and humanitarian gesture of civil society and NGOs such as EKSWCO, WWO, Changtam Aane, Mothers’ Group, Loving and Sharing Youth Network, AEKSU and others. Meanwhile, BJP unit of the district led by its President L. K. Yangfo expressed gratitude to the HCM for his timely and generous assistance to the fire victims. Affected families were jubilant on receiving the assistance and thanked the HCM for bringing immediate succour to them.